Getting the kids ready to go back to school can be stressful and time consuming. Add to that the stress of thinking up new and exciting, yet nourishing foods to add to their lunchboxes, and one can easily feel overwhelmed. The proper nourishment at school can be the difference between your child feeling energized, engaged and enthusiastic, to feeling lethargic, distracted and moody. Remember opening up your lunch box only to find that same old peanut butter and jelly sandwich, or white bread and baloney sandwich? myWholeLife wants to ensure your children’s lunches are not only healthy but also child approved, and we created two weeks worth of lunchbox ideas to help you achieve just that. 1.) One of our favorite ideas for the younger kids is to wrap foods in nitrate free bacon! It is packed with protein and healthy saturated fats, and even your child’s least favorite vegetables will become appealing. Try bacon and kale wrapped squash or yam bites. These tasty nuggets are a fun, gluten and dairy free way to serve up a balanced meal that will keep your kids feeling energized and ready to learn. They are a nice way to sneak in some vitamin and mineral packed kale, without your kids even noticing! Bacon wrapped salmon cakes with asparagus is another way to get lots of healthy fats and omega’s and sneak in some more vegetables. Tip: use toothpicks to keep them wrapped while baking in the oven. 2.) Why not wrap their favorite cheese and vegetable or fruit in nitrate free lunch meats? Some ideas are cheddar and apple wrapped in nitrate free ham, or mozzarella and red pepper wrapped in nitrate free salami. Nitrates are compounds added to cured meats to help keep their color and preserve the meat. However, when ingested, these relatively benign compounds are converted to nitrosamines, especially in the presence of protein, and become carcinogenic. So be sure to buy nitrate free luncheon meats, or reduce consumption of those meats. 3.) Did you have Mexican for dinner last night? Excellent! Cook once, eat twice! Make a fun nacho box with bean dip, avocado dip and organic corn chips. Add some cheese slices and a tomato salsa. This lunch will keep your child going all afternoon, and help them to recover from the morning gym class. Always remember it is important to balance all meals with a complex carbohydrate, protein and fat to keep the blood sugar stable and reduce lethargy and moodiness. 4.) Skewers! Throw some of last night’s protein and roasted vegetables on skewers and serve with whole milk yogurt dip. This is fun for kids and offers an alternative to the oh so boring sandwich. Chunk up your leftover fish, beef, chicken, or pork and alternate with some leftover vegetables on the skewers. Remember cook once, eat twice! These can be made the night before while you are cleaning up after dinner. 5.) Wraps! But, let’s think outside the wrap. You know those large flour tortillas that are typically used for wraps? They are not the healthiest choice when it comes to carbohydrates as they are made from white flour which has been stripped of it’s nutrients, bleached, and then enriched with vitamins and minerals that the body can not absorb. White flour products also act like sugar in the body because it has no germ, which renders it a simple carbohydrate, as opposed to a complex carbohydrate. In light of the above, a great substitute is a corn tortilla, or even better, a sprouted corn tortilla! These can be used to wrap any of your favorite sandwich foods. After you wrap them, try cutting them in 1 inch pieces to make easy finger food for the kids. 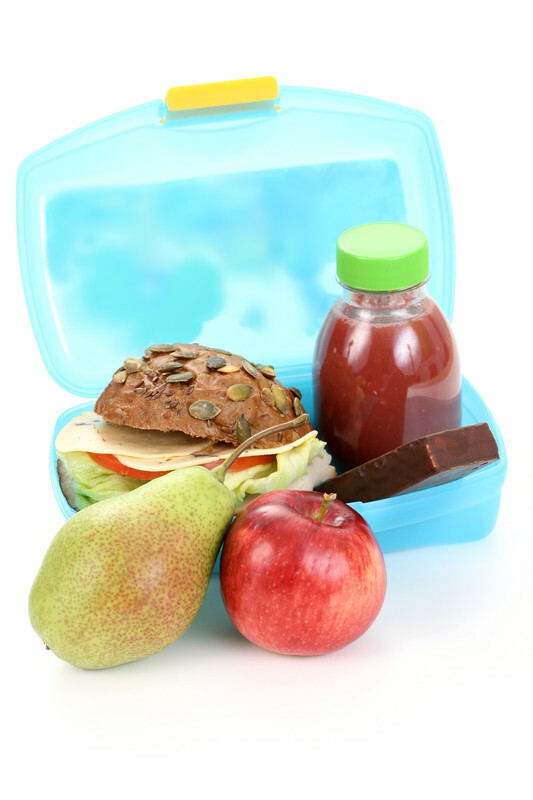 Be sure to stay tuned because next week we will provide you with 5 more delicious and nutritious lunchbox ideas!